Can I change my Template after I've created one? We've included a nifty feature to enable our users to change the Template type after editing it. This is useful if you've selected a Template, input some data, and decide another Template is more suitable for the data you've used. But how do I change the Template? While on the Template editing page, click on the 'Change Template' button located near the top right of the screen. Once you have selected 'Change Template', you will see the 'Change Template Type' screen as shown below. To change the Template type either type in the Template name inside the text box or use the drop-down arrow to select from a list. After that, hit 'Change'. 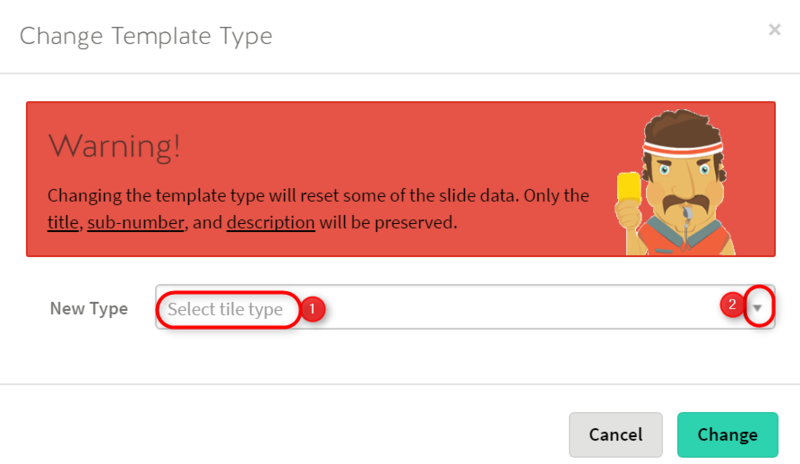 Changing the template type will reset some of the slide data. Only the title, sub-number, and description will be preserved.